Dancing dragons, unicorns and lions, firecrackers and fireworks displays, martial arts demonstrations and all kinds of Chinese nibbles. It must be Chinese New Year! And in 2019, expect to see plenty of representations of pigs, because the Chinese New Year beginning on February 5, 2019, is The Year of the Pig. 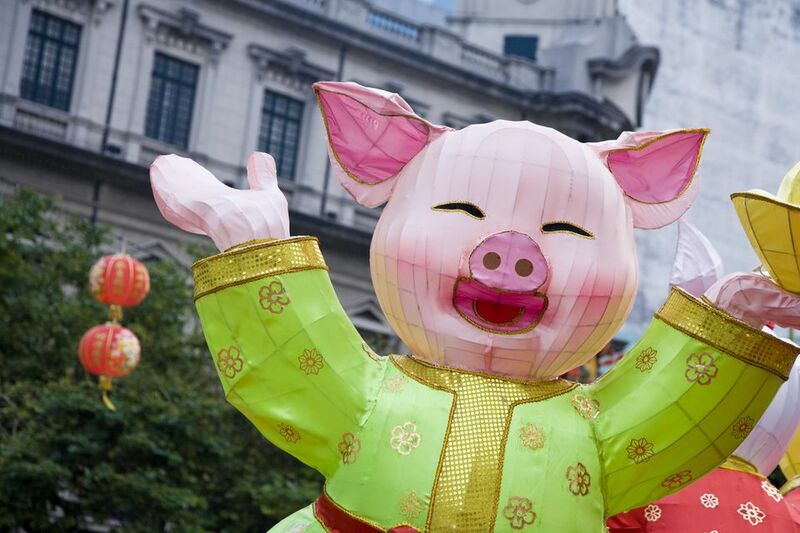 In 2019, cities and towns all over the UK welcome the Year of the Pig between February 1 and 10, taking in both weekends surrounding the main date. Birmingham February 5, loads of free events at The Arcadian in the Chinese Quarter from 11:30. Chinese Acrobats, singing, the Chinese Dragon Dance and Martial Arts. Hurst Street will be pedestrianized for the day. At least 30,000 people turn out for all the free events. Find more at the Visit Birmingham. The Chinese community in Birmingham sponsors a festival that gets bigger and better every year - but they are very late in posting details so you'll need to check back with Visit Birmingham and The Arcadian closer to the date. Chatham, Kent A small town but a big party. At one time this was third largest Chinese festival in the UK. In 2019, The Year of the Pig will be welcomed with a parade. Details had yet to be announced at the time of this writing. Liverpool Did you know that Liverpool's Chinese Arch is the largest outside of China? As always, the arch, on Nelson Street, is where the oldest Chinese community in Europe celebrates. February 10 is the date in 2019 and there will be everything from a mass Tai Chi demonstration and a dragon and lion dance parade, to a Taste of China festival and a firecracker display. Check the Chinese community website nearer the date for all the events. London, Trafalgar Square Traditionally, the London Chinatown Chinese Association celebrates on the first Sunday after Chinese New Year. That's February 10 in 2019, the Year of the Pig. Events kick off with a grand parade along the Strand, Charing Cross Road and Shaftsbury Avenue followed by Trafalgar Square festivities. International artists, both Chinese and Western opera, and a firecracker demonstration over Leicestser Square that promises to be deafening. It's all happening between 10am and 6pm. Check the Chinatown Blog for all the latest. Manchester puts on the biggest Chinese New Year celebrations in the north with four days of partying. In 2019, the main Chinese New Year festivities, including Dragon and Lion Dancing, Kung Fu demonstrations, folk dance performances, fireworks and a spectacular Golden Dragon Parade will take place on February 7 to 10 in Chinatown, Albert Square and across the city center. Find out more. Newcastle-Gateshead Newcastle turns Chinese New Year into a many splendored thing, with loads of events in the days and weeks leading up to the big day. Puppet and basket workshops, exhibitions and performances are all part of the fun. But, sadly, they do take their time announcing the details and the dates. Check back with the city's website closer to February for full details. Nottingham usually goes to town for Chinese New Year, hosting entertaiment and fireworks. Every year there's a full schedule of workshops and events leading up to the big day and a Chinese New Year Gala on February 9 and 10, presented by the Nottingham Confucius Institute (NCI) and the Asia Business Travel Expect musicians, dancers, martial artists and singers from the local and national Chinese communities. This is a ticketed event at Nottingham's Djanogly Theatre.